Not every run is enjoyable. Some runs are just work. But that's okay. The hurt and the work are what make our accomplishments so sweet. Revel in the entire training experience, even the long run. Running is a blessing and an opportunity to be cherished. Finishing the last sip of lukewarm coffee, I picked a few stray grounds off the tip of my tongue. Two cups should do it. Sufficiently caffeinated, I checked the weather app on my phone one last time. Thirty-two degrees with a "real feel" of twelve degrees thanks to high winds barreling down from Canada. I wore running tights, a long-sleeved shirt, wool socks, a running hat resembling a swim cap, mittens, and sunglasses. After some consideration, I grabbed my Brooks Ghost 8 running shoes because I like the support and comfort they give me. They don't feel as fast as some of my other shoes, but today isn't about fast. My Boston Marathon plan calls for an 'easy' fifteen miles. The distance alone doesn't intimidate me, but two hours of long, slow running terrifies me. I've never been much good at these long runs that bore me, yet demand unrelenting focus for hours on end. Nine times out of ten, I run too fast and turn it into something it wasn't meant to be. Maybe the running backpack I'm reviewing for the blog this week will slow me down. After filling the bladder with water and adjusting the chest straps to minimize any bouncing and chafing, I put the bright blue backpack on and stow my phone in one of the many pockets. So many pockets in fact, that I grab an energy gel just to fill another one. Feeling overdressed and a little ridiculous, I bounced and stretched while my GPS watch synced with a satellite hurtling through space. I completed the first mile of my long run looking like a marionette controlled by a spastic puppeteer, and sounding like a washing machine thanks to the swishing contents of my new backpack. This should be fun. Two miles down the road, the wind cut through the knitting of my running shirt like water through a sieve and my thumbs were slowly going numb. I know what you're thinking and yes, they're related. Note to self: It's winter you moron. After an hour of plodding, I began scanning the passing tree line. The incessant splashing in my backpack introduced an issue that could only be addressed behind the cover of trees. New England foliage is a bit underwhelming in late December, so I hunted for trees with substantial trunks. Having found the ideal spot, I was rudely interrupted by a barking dog intent on sharing my location with anybody who had ears. Around 9 miles, I snapped a quick selfie overlooking the ocean. It's something I don't often do, but it turns out a running backpack is good for something. I even swished and spit and had a quick drink. The water tasted like plastic, but it was wet like water should be. Running down Boylston Street, the race clock shows 2:58:45. The crowd chants Ja-son, Ja-son... My left foot slides out from under me on the black ice before I know what's happening, ruining my endorphin-fueled dream. Luckily, millions of years of evolution help me avoid catastrophe, embarrassment, and a pulled groin this time around. The last two miles are the worst. My feet hurt, my sunglasses won't stay in place, and the backpack water-torture has me at my breaking point. I remind myself that the long run is about discipline and mental toughness. 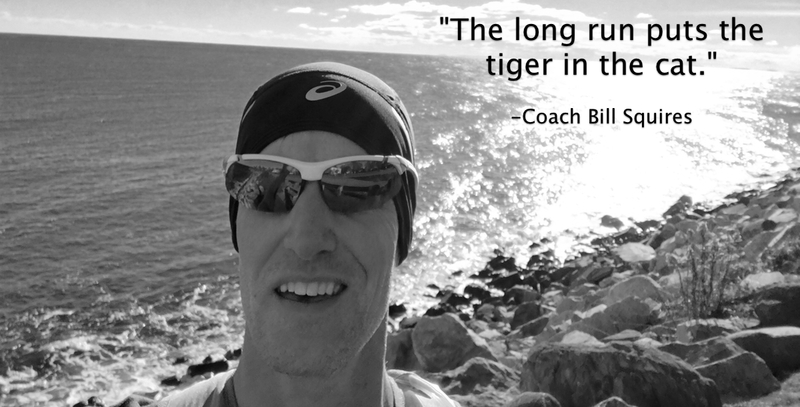 The long run, as coach Bill Squires said, "puts the tiger in the cat."